Homemade food gifts, holiday gift baskets, sugar free cookies and cakes, gourmet gifts and rum cakes. Includes honey recipes, about the beekeeper, and storage tips. A sugar free store with products for diabetics, dieters, and those who cannot or choose not to use sugar. Mary Glendas dessert recipes are sugar-free, fat-free, gluten-free, diabetic friendly. Specializes in 'sugar-free' and 'no sugar added' products which are safe for diabetics. Includes catalog of available items and online ordering information. A variety of candies including turtles, mints, handmade truffles, fudge, Jelly Bellys, maple goods, and sugar-free items. Selection of low carb and sugar free products for Atkins, Sugar Busters! and diabetic diets. Freshly baked muffins including sugar-free, fat-free, tops only, and mini-muffins. All are lactose-free. Ships in USA. A retail and web based store with a large selection of gluten-free or gluten and casein-free, low sodium or sugar-free foods. Old-fashioned candies, some in sugar-free or additive-free versions. Sells sugar-free or no sugar added food products for diabetic persons or dieters, plus cookbooks and diabetic medical supplies. Hand dipped chocolates. Choose from milk, dark, sugar free, caffeine free or a pre-packaged assortment. Specializing in sugar free and low carb collections in a wide variety of themes. Includes nutrition information. Sells candy and chocolates from Europe and USA, plus several lactose-free and sugar-free varieties. Ships in continental USA. Gift trays and baskets of nuts, dried and chocolate-covered fruit, and Godiva chocolates. Includes sugar free, kosher and fat free items. Waffle and pancake mixes including sugar free and fat free varieties. Corn dog and funnel cake mixes are also available. Manufactures and sells sugar free and fat free cookies, brownies and syrups. Made with potatoes to replace a third of the sugar. Also sells sugar-free fudge, not made with potatoes. Huge selection of low carb and sugar free products. Sugar free, low carb chocolate and candy. Russian sherry tea cakes, plus sugar-free muffins and loaves. Candy, cookie, or chocolate bouquets, including sugar-free selections. Provides everyday and specialty tidbits that are free of sugar, salt, or preservatives. Canadian wholesaler and retailer of traditional confectionary and sugar-free candy. Chocolate covered nut clusters, both regular and sugar-free, plus fudge, turtles, and break-ups. Featuring sugar free, low calorie and diabetic chocolate, candy, desserts and recipes. Offers an assortment of regular and sugar-free candy in bulk packages. Distributor of sugar-free candy, chocolate, syrup, cookies and wafers. Handmade hard candies and chocolates, including sugar-free and huckleberry selections. Offers natural and sugar free syrups, tea and specialty flavored drink concentrates. Featuring Swiss chocolate bars, truffles, sugar-free and organic selections. Offers a wide variety of flavors and sizes including sugar-free and low carb varieties. Offers envelope-free cards printed on sugar cane paper and recycled currency. If the business hours of Honey Garden Gifts in may vary on holidays like Valentine’s Day, Washington’s Birthday, St. Patrick’s Day, Easter, Easter eve and Mother’s day. We display standard opening hours and price ranges in our profile site. We recommend to check out honeygardengifts.com/ for further information. 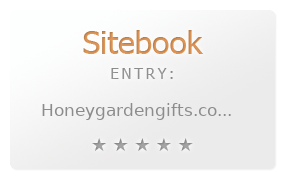 You can also search for Alternatives for honeygardengifts.com/ on our Review Site Sitebook.org All trademarks are the property of their respective owners. If we should delete this entry, please send us a short E-Mail.